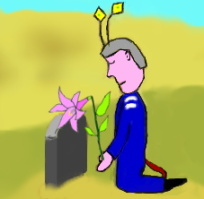 The pilot placed a flower on the grave and prayed. He went to the place where he had bombarded. There he saw a tombstone-like object on the ground. Many citizens gathered around him. The pilot placed a flower on the grave and prayed in silence.